I keep discovering more people every day who make beautiful and functional things that enhance the quality of life. These people are all artists in their own way and they all have interesting stories on how they came to Floyd and became professional crafts people. My long-term mission is to get all of these people blogging on their own so you will be kept up to date on what they are producing and how they view their life and their work. That may take a little time as they are not all Internet-enabled. Until that happens, I have an opportunity to present their work and their stories. I have a bit of a backlog of artisans to present, but I will buckle down and try to produce a few posts every week on the people who make Floyd the arts and craft center of this region. I hope to let their work do most of the talking. This post introduces the work of Bill and Corinne Graefe. 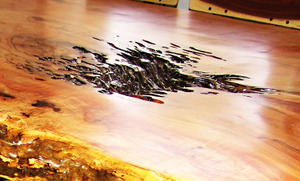 The image at the top is a close-up of the top of a remarkable conference table that can be found at Phoenix Hardwoods on Rte 221 just north of Floyd, VA. The rest of the table is shown here. 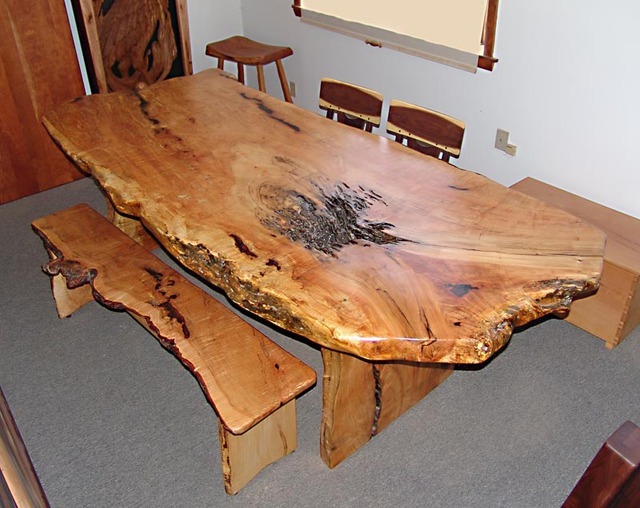 If I ever need a conference table again, I will move heaven and earth to get this one or one like it. It has the feeling of a table where difficult projects get accomplished against all odds. It is also a table for the terminally insouciant who think outside the box most of the time. There is an aura about this table that seems to call for incredible results. I expect that Bill and Corinne Graefe intended to create that effect. Their workshop/showroom is full of similar examples of the woodworking art and all have a unique character. Gretchen and I were so impressed with their work that we have asked them to build us an end table for our new home. I will be showing more of their work in a future post and will be blogging the saga of our custom end table. I think you may find it interesting. This piece is stunning. You’ll be busy for quite awhile, with all the wonderful artisans in Floyd County. David is that table currently for sale?